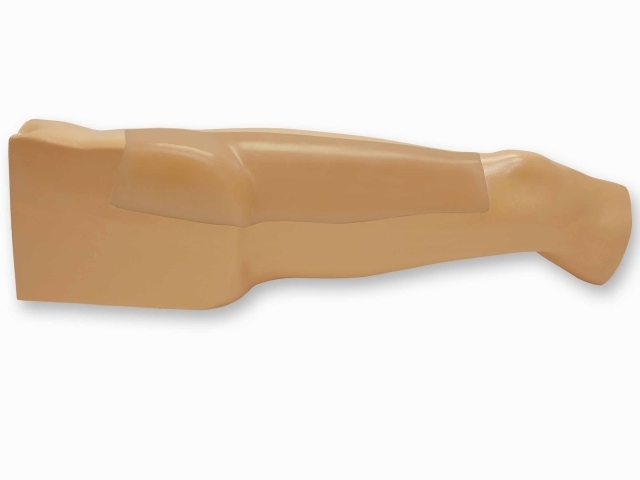 Blue Phantom’s leg vascular access ultrasound training mannequin model allows users to develop and practice the skills necessary to gain proficiency in using ultrasound to guide needle and catheter insertions in the saphenous and femoral vein. Using Blue Phantom proprietary simulated human tissue, this very realistic and ultra-durable venous access ultrasound training mannequin is excellent for training clinicians in the psychomotor skills associated with ultrasound guided vascular access procedures. These ultrasound imaging skills include; using ultrasound system controls, transducer positioning and movement, recognition of venous anatomy, using ultrasound to target the appropriate vessels for cannulation, and performing a central venous access procedure. Additionally, a deep vein thrombosis (DVT) option allows users to learn to identify the presence of thrombus in the deep vessels. We know that gaining proficiency in using ultrasound requires practice. 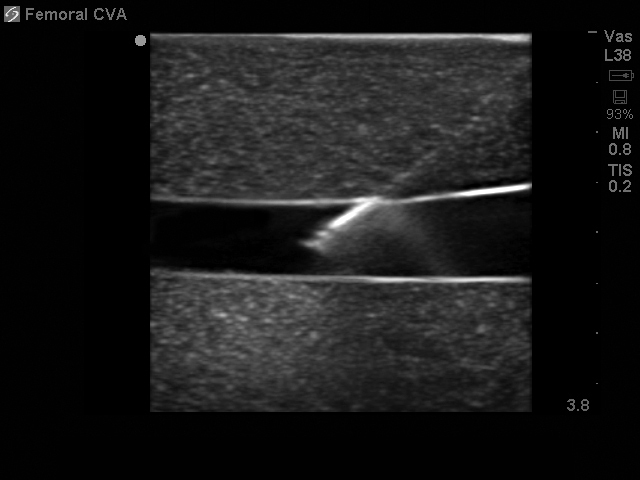 Our self healing tissue will allow you to repeatedly perform ultrasound guided saphenous and femoral vascular access and ablation procedures without giving second thought to wearing out the tissue or calculating the cost per cannulation. 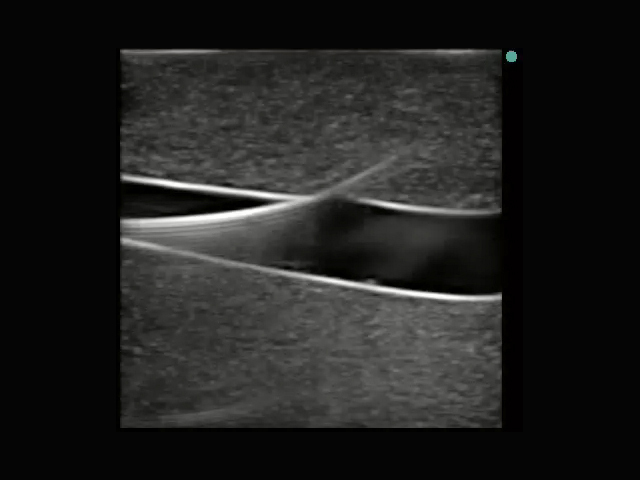 Whether you are learning to guide the needle to the targeted vessel or performing the entire ultrasound guided central catheter insertion procedure, you can expect unmatched durability from our tissue and vessels. This ultrasound training mannequin is constructed using Blue Phantom’s patented ultra-durable tissue and is extremely realistic in ultrasound imaging characteristics and feels like real human tissue. Our self healing tissue will withstand tremendous use and will save you money by dramatically reducing the necessity for purchasing replacement parts. Practice to access and perform procedures on our realistic ultrasound training model. 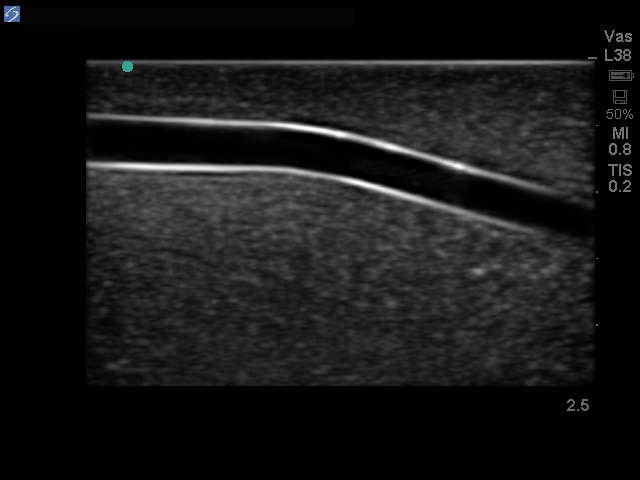 Use ultrasound to identify and target anatomically correct vascular anatomy of the upper and mid leg including the saphenous and femoral veins and tributary veins. All of the vessels accommodate full threading of guidewires and catheters and is perfect for teaching and demonstrations for sapheno-venous ablation procedures. Excellent for new users as well as more experienced users who are refining their vascular access procedural skills, the vessels in this venous access medical training mannequin can be accessed with needles as well as fluid can be injected into the model to verify needle tip location. Injected fluids are automatically expelled so that the model can be used repeatedly for training. 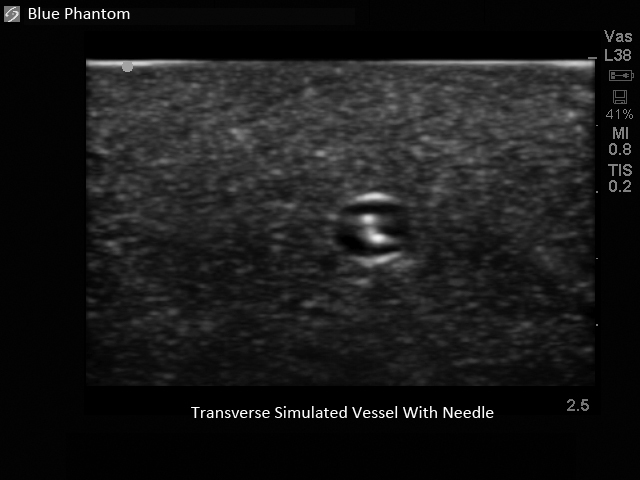 At Blue Phantom we expend tremendous effort to match the imaging characteristics of real human tissue allowing you to teach and train under optimal conditions. We know that the best simulation training scenarios are requisite on users experiencing the same procedural realism as performing the procedure on patients. All of our simulation materials match the acoustic characteristics of real human tissue so when you use your ultrasound system on our training models, you experience the same quality you expect from imaging patients in a clinical environment. This medical simulation trainer will perform well using any ultrasound imaging system configured with the appropriate transducer (recommended ultrasound transducer; high frequency linear array ultrasound probe 5.0 – 12 MHz). This ultrasound phantom model is excellent for specialties including anesthesiology (anaesthesiology), emergency medicine, cardiology, critical care medicine, radiology, surgery, surgical training programs, ultrasound training programs, simulation centers, surgical skills centers, medical education facilities, and ultrasound manufacturers for ultrasound education and demonstrations. Realistic and ultra-durable saphenous and femoral vascular access ultrasound training model excellent for training clinicians in the psychomotor skills associated with ultrasound guided procedures. 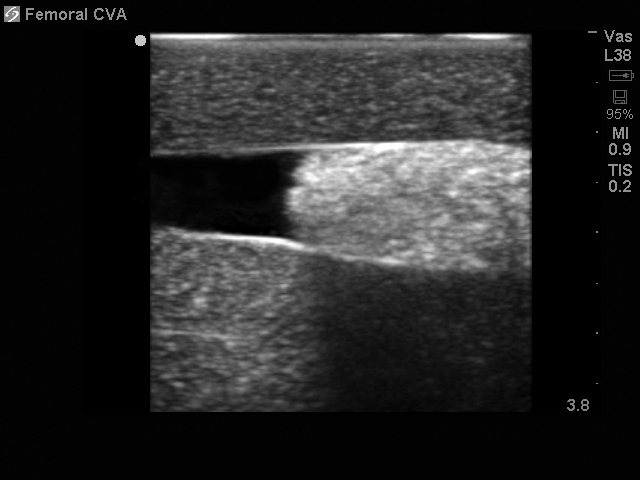 Add a thrombus in the femoral vein to help users identify the appearance of thrombus in the deep venous system of the femoral vein. The DVT is non compressible. Also excellent for experiencing a resistance to threading guidewires and catheters due to deepvein thrombosis (DVT). Transparent Internal Jugular Central Line Ultrasound Manikin - NEW! Internal Jugular Central Line Ultrasound Manikin - NEW!